The 2015 Southern Comfort Conference took place at the Bonaventure Resort & Spa in Weston, Fla. Sept. 29 to Oct. 3 with more than 400 transgender activists and allies in attendance. This was the first time the conference has been held in Florida. 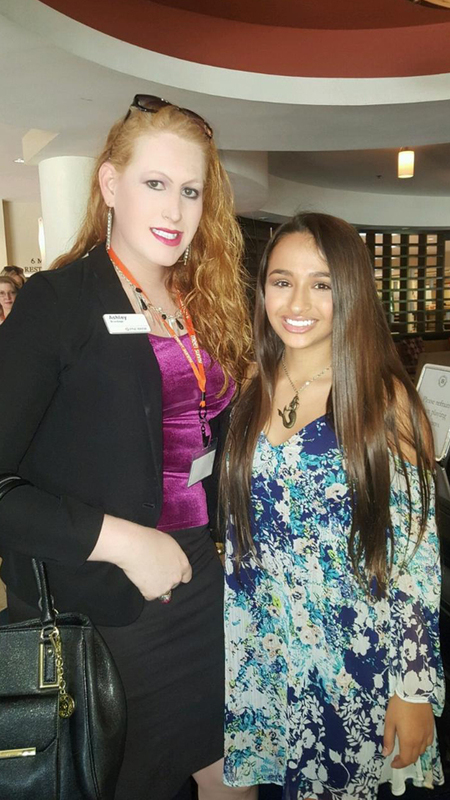 Transgender activists Ashley Brundage (L) and Jazz Jennings were among the more than 400 attendees at the Southern Comfort conference in Weston, Fla. Sept. 29 – Oct.3. Photo courtesy Ashley Brundage. Southern Comfort is a Georgia-based group, celebrating its 25th anniversary this year, and is the largest gathering of the transgender community in the world. The five-day conference is meant to provide support and includes“detailed legal and medical presentations; and informative sessions on family, relationships, sexuality, and tips on makeup, presenting, and many more topics,” according to their website. “It’s crucial for education,” Ashley Brundage, a Tampa-based transgender activist and personal banker for PNC Bank, said, according to the Miami Herald. This is Brundage’s third Southern Comfort conference. Trans celebrities Laverne Cox and Caitlyn Jenner have given the community much needed visibility to many,but “people, including gays and lesbians, still have misinformation about the transgender community,” said Paul Abad, a Fort Lauderdale gay man who also works at PNC Bank, according to the Herald. “At PNC Bank, I am the senior banker for the Broward market. I’m also the community liaison between the gay, lesbian and transgender communities. I’m on the gay, lesbian, bisexual, transgender council for the company, as well as being the liaison with Equality Florida,” Abad said. The conference included two prominent Florida-based speakers; Broward’s trans teen celebrity Jazz Jennings and Orlando’s Gina Duncan, Equality Florida’s transgender inclusion director. Duncan said to the crowd that one of the things she is most proud of was getting a statewide transgender resource guide published. The Transgender Resource Guide was developed to provide a directory of quality trans-friendly service providers from across the state of Florida and is available for download here.